Aniconism refers to the art in which portrayals of the Buddha in human form did not occur. In the late nineteenth and early twentieth centuries, Buddhologists were puzzled by the absence of anthropomorphic representations of Sakyamuni Buddha in the earliest surviving Buddhist art, and it was assumed that the early Buddhists either avoided Buddha images entirely, or favored the use of symbols to refer to Buddha or important events in his life. For example, the depiction of a specific tree in early stone reliefs was interpreted to signify Buddha’s enlightenment beneath the bodhi tree. 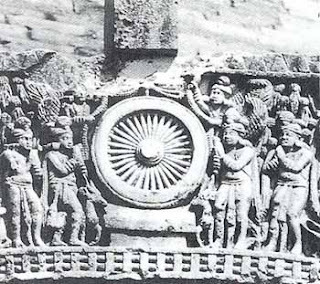 Similarly, portrayals of the wheel representing Buddhist law (Dharmachakra) were thought to be symbolic representations of Buddha’s first sermon. The early twentieth-century writer Alfred Foucher was the first to articulate the theory, which has been universally accepted for nearly a hundred years. He based his ideas on the assumption that the earliest Buddha images were those produced in the Gandhara region of ancient India during the early centuries CE—more than half a millennium after the Buddha was supposed to have lived. In Gandhara, he surmised, artists were influenced by the Greek and classical world, which stimulated the anthropomorphic images of the Buddha. The Bimaran Casket, with the Buddha surrounded by Brahma, left, and Sakra, right. British Museum. Dated between 30 BCE to 60 CE. Nonetheless, a fresh analysis by S. L. Huntington based on archaeological, literary, and epigraphic evidence casts doubt on the practice of deliberate avoidance of Buddha images. Proponents of the theory have contended that the practice of creating anthropomorphic representations of the Buddha was initiated only when Mahayana Buddhism began to flourish around the early centuries CE. However, others have argued that, on the basis of textual evidence, Hinayanists were probably as receptive to the making of images as Mahayanists. Indeed, in the entire corpus of Buddhist literature, scholars have been able to find only a single, indirect reference to a proscription against the creation of Buddha images, and that is limited to the context of a single Buddhist sect. If this is correct, the Buddha himself had no objection to having images made. Indeed, I cannot see what objection Buddha would have had to creating images in his likeness, if it would help his followers to remember him by. Don't forget that in Buddha's own day his growing sect had to contend with many "heretical" rivals, including the Jains. Also, in the first couple of centuries after the death of Buddha he was regarded merely as a philosopher, an ordinary human being, and not as a divinity, so there wouldn't have been any proscription against making Buddha images. Archaeological evidence also challenges one of the mainstays of the aniconic theory, namely, the long-held conviction that the Buddha image was first created during the Kushan period around the first or second century CE. Recently a number of sculpted Buddha images belonging to the pre-Kushan period have been identified. The early date of these images confirms that representations of Buddhas were being produced at the same time as the so-called aniconic relief panels, thus suggesting the absence of Buddha images in the reliefs cannot be attributed to the widespread prohibition of Buddha images. Relief panel with monks and lay people circumambulating a stupa, circa 2nd century CE, Schist (15 x 19.3 cm. ), British Museum. Pakistan, ancient region of Gandhara, circa 2nd century CE, Schist 28.6 x 32.4 cm. The Metropolitan Museum of Art. There could be other explanations: 1) early anthropomorphic images of Buddha may not have survived, or have not been discovered yet. As more ancient images of the Buddha come to light, the aniconic theory will disprove itself; the earliest images of Buddha seem to be on a gold coin (Approx. 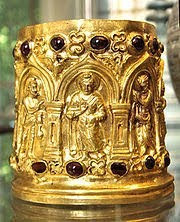 130CE) minted by Kushan King Kanishka, and the Bimaran casket (Earliest date 30BCE), and 2) perhaps the early Buddhists didn’t believe in a real Buddha, (there were supposed to have been 25 previous Buddhas in this Aeon alone) and only later, perhaps after the Third Buddhist Council convened by Ashoka circa 250-253 BCE, that a need for a historic founder was agreed upon. Watch the video below (Open Source Buddhist Research Institute - Madison) for a traditional view of Buddhist aniconism.